The internationalization of the reform movement is changing the ways in which governments operate throughout the world (Kettl, 2000). The ICT revolution is fast spreading its reach from private enterprises to bureaucratic agencies. As a result, electronic government (e-government) is both encouraging reform and, in itself, is a way of reinventing traditional structures and procedures and improving how the machinery of decision-making works. The scale of e-government developments is the subject of much research on a global perspective (Kamark, 2004). They show different and conflicting theoretical and ideological paradigms, but very little effort has been made to formulate a framework to define the e-government regimes that emerge in different political and institutional contexts. Since the characteristics of the World Wide Web (WWW) become the parameters from which to evaluate the public organizations and their capacity to innovating in regard to technology policy, the dominant vision of e-government emphasizes service delivery. 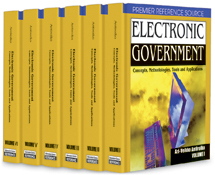 As Forlano said (2004, p. 35) “the case studies ... bring to life common classification of e-government stages … ,” not to a typology focused on political and institutional features. In this way, a crucial point is underestimated; namely, that the restructuring of the administrative apparatuses because of the WWW is a political choice, and does not take place in a institutional and ideological vacuum, which at the end of the day expresses its nature, whether democratic or otherwise (Barber, 1999).